I recently had an opportunity to speak with Dr. Jordan Weeda of Wellspring Centre for Body Balance. 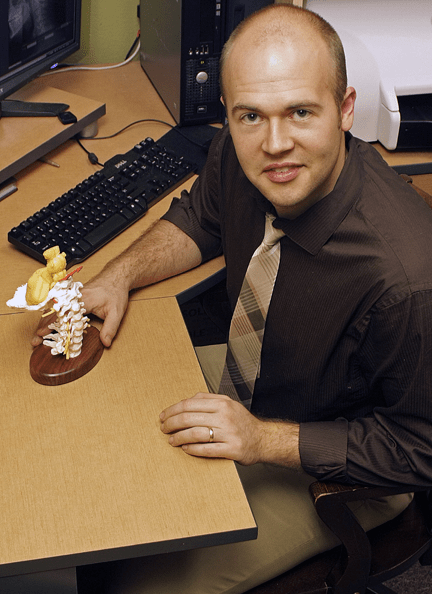 Dr. Weeda practices a unique form of Chiropractic care called NUCCA which is a safe, gentle, and effective way to return the body to its optimal state of balance. Dr. Weeda, Thanks for taking the time to speak with us today. Can you please give us a little background on the NUCCA technique? Sure! NUCCA is an acronym for National Upper Cervical Chiropractic Association. The focus of the NUCCA work is the relationship between the upper cervical spine (neck) and its influence on the central nervous system and brain stem function. It is this relationship that affects every aspect of human function from the feeling sensations in your fingers to regulating hormones, controlling movement, and providing the ability to hear, see, think, and breathe. NUCCA was developed in 1966 by Dr. Ralph R. Gregory of Michigan. His work was an advancement of chiropractic research on the upper cervical spine that started in the early 1930’s. Today NUCCA continues to advance as new developments in technology, spinal biomechanics, and biotensegrity influence the work. In 2006 NUCCA made news in healthcare when a study showing that NUCCA care normailized high blood pressure in people with hypertension. Currently work is underway to demonstrate how a NUCCA correction improves bloodflow through the brain! Worldwide, there are about 300 doctors who specialize in this work. I’m the only NUCCA chiropractor between Sacramento and Eugene. Why did you choose to call your practice Wellspring Centre for Body Balance? Well first of all, I came up with the concept for Wellspring Centre for Body Balance long before my wife and I ever found Ashland. When we got here we discovered that there are several other businesses with similar names. When I chose the name Wellspring, it wasn’t in reference to any water source, but to the inner source of healing potential every person carries within them. When the spine is properly aligned and the body is balanced, that inner source of healing potential is able to work at its best. Its pretty amazing to see the things that change for people just from a gentle adjustment behind the ear. The practice is evolving into a true “centre.” We now have a great massage therapist, Erin Daugherty, LMT working with us. She practices an amazing modality called Ashiatsu. We also have a great Aruvedic practitioner, Noah Volz, working with us. How does the NUCCA technique differ from a more traditional chiropractic approach? Most traditional chiropractic approaches focus on a “segmental dysfunction” or “bone out of place” theory. A quick thrust, or twist, usually accompanied by that “crack” sound is how most chiropractors adjust the spine. While this theory generally makes sense, and it works in many cases, it doesn’t really stand up to research. When you think about the spine from a holistic point of view, you see that the spine functions as a unit. One part can’t move without it effecting another part. Research backs this up. Studies in human movement show that in the simple action of lifting the left arm, the first muscles to engage are in the right calf! NUCCA focuses on adjusting the entire spine from a single “leverage point” at the top of the neck. This area at the top of the neck is highly influential on spinal balance, not only because it’s the balancing point for the skull, but because it is the single most richly innervated area in the human body. Not only does almost every nerve connecting the brain to the rest of the body pass through this area, but the joints and muscles in this area provide the brain with significant amounts of information about where the body is in space. If this area is out of balance, it sends that “out of balance” information to the brain, and it begins to build an altered sense of reality, or a body map that is out of balance. This is when you see people with one shoulder higher than the other, one leg shorter than the other, and their head tilting to one side. By correcting the spine from this area, we not only balance the body by bringing the head and neck to a centered point over the body, but by balancing the information the brain is getting from that sensitive area at the top of the neck. Can you explain how treating the jaw area affect the rest of the body? If you watch the video on my website (www.wellspringbodybalance.com), you’ll see me adjusting someone. It looks like I’m just barely touching them near the earlobe and jaw area. This area is where the top bone in the neck is located—usually just under the ear lobe. If you touch there, you might be able to feel a firm bump. That is the transverse process of the atlas (C1) and its about 3/4″ under the skin. When I adjust someone, I align my body with a very specific point in space or “vector”. The vector is calculated from a three dimensional x-ray analysis done on the computer. This specific vector allows the amount of force the patient feels on the table to be next to nothing. In the adjustment there is no more pressure than you would comfortably place on your eye. What are some of your favorite success stories? You can read dozens of great testimonials on our website, but here are some of my favorite. My symptoms started last Aug. on vacation so this year has been a long hard one. I felt like a lot of the docs I saw thought it was all in my head but I never felt that way with you. One suggested I see a Psychiatrist and gave me a prescription of Xanax and said that all my symptoms were from anxiety! The crazy tingling in my head is almost gone I only get it rarely now. Thank you, Dr. Jordan, for your invaluable assistance. You have done for me what a dozen chiropractors and nearly 40 years of constant therapy could not! Since I had an injury many years before to my neck he allowed me to see that this was stemming from the neck misalignment. Once that was corrected I threw my orthotics away, and have stable hips for the first time in close to 50 years. Hurray! What types of health conditions are best treated by NUCCA? NUCCA is not a treatment for any other health condition than spinal imbalance. However, many health conditions are related to spinal imbalance. Most commonly, I work with people dealing with chronic pain conditions, fibromyalgia, migraines and other neurological problems, fatigue, hypertension, ear infections, the list goes on…. Favorite activity you enjoy when you are not working in the clinic? My wife and I bought a house on the north end of Ashland last year, and we keep ourselves busy with remodeling and landscaping projects. We have chickens and a garden in our backyard. Our two children Elle (2 1/2) and Aryn (10 mo) also keep us very busy. What does a typical chiropractic secession look like? On the first visit I always do a complete work-up. Its important that I get a good understanding of the person’s background and lifestyle before working with them. The first visit consists of a thorough consultation, a chiropractic exam, and three special low-exposure digital x-rays of the the head and neck. After I’ve analyzed the images, we bring the person back on the next visit to talk about what’s going on and how we can help. Then we do the initial NUCCA spinal correction, this first adjustment takes the most time because we’re working to get the best correction possible. This reduces the amount of follow-up care needed. On follow up visits the primary concern is to make sure the spine is stabilizing in its new place of balance. As the person’s body goes through it’s own unwinding process I often will incorporate some other techniques to facilitate that process and help the body to stabilize more quickly. I find that proper gait and foot biomechanics are critical to optimizing spinal balance, so in many cases you’ll see me adjusting the feet. I also employ a technique called Cranial Spinal Integration to help release tension on the spinal cord as the spine decompresses. In some cases where there is shortening of the muscles that support the cervical spine, I’ll incorporate Active Release Technique to help those muscles the lengthen. I also teach my patients stretches they can do at home. No person is exactly alike and no visit is exactly alike. On every visit we do what needs to be done to achieve or maintain optimal spinal balance. Can babies and children be treated using this technique? I love working with kids. I adjusted my daughter Aryn when she was just one day old. She had a very fast birth with the cord around her neck, so she needed an adjustment to get her best start on life. Typically babies are much more resilient and less stuck in patterns than adults, and I rarely need to take x-rays on babies. Babies typically come to me with issues like torticollis or colic. I’ve also worked with a number of children with chronic ear infections. One 11 year old was due for his 3rd set of tubes, but since he’s been adjusted over a year and a half ago he hasn’t had one infection! Any last comments or notes for our readers? I’m going to be doing a talk about NUCCA at the Rogue Valley Health Fair in Medford on January14th. This looks to be a fun informative event. Learn more at www.roguevalleyhealthfair.com. To Locals Guide readers, we are offering a savings of $99 on the new patient package. This includes two days of service with the consultation, exam, special x-rays, initial spinal correction, and lots of information. We always offer a free consultation to folks who have questions, and aren’t sure if NUCCA care is right for them.